If you talk to chemists, there's ways to chemically add the chrome plating. It's also not the same as chrome plating used in modern electroplating; what you see on the Chinese chromed bronze is sodium chromium oxide. Steel is actually very hard to make, especially consistently. How to control temperature without thermometers so that the steel is in the right phase? how to ensure that the carbon from the fuel does not contaminate the crucible and transform the steel into a different steel that you want? Tempering, forging, the clay is to insulate the steel so that when it cools, it is slower and the crystal is larger so softer.. these are all techniques but at the end of the day, ancient sword making is a hit or miss. it is like the modern chipset industry, a few example will come out just right and given to lords, many of them will have minor defect and be arm the elite troops and the ones which turned out just okay would be issued to regular troops. Thinner, harder swords are more brittle and prone to break. Making edges extra sharp can make these edge prone to cracking. Sword longevity is not a problem unless you are a sword collector, and even then you are not likely to use the sword so many times. So the steel QC varies, so what? How many times do you expect the sword to be used or last in the battlefield? Since somehow you have to expect the soldier to survive in the first place. The swords themselves are mainly backup to polearms. To deal with the variance of steel quality, this led to dao being shorter, broader, and thicker with flaring ends as time goes on. The long thin proto-katana two handed ring dao would give way to dadaos and zhanmadaos. Chop! Chop! This led to the far better and more popular image of the dao. During WW2, dadaos are being made ranging from steel taken from railway tracks to pots and pans, yet capable of breaking through Japanese military issued gunto and decapitate opponent. Where is the QC in those dadaos? I heard that Japanese soldiers carrying ancestral katana did much better on melee combat than those using gunto, and this led to the practice of Japanese soldiers going away to war with either ancestral katana or families paying a skilled swordsmaker to make a high quality sword as a going away present and insurance for their son. Japanese swords or nihon-to are well known for their craftmanship, and they were being seriously collected as early as the Song. But during the Mongol invasion of Japan, the Japanese swords were breaking against Chinese and Mongolian armor, leading to the back of the swords being made thicker. Longevity to last a battle. if longevity doesn't matter than viking warriors will not pay for the famed Ulfberht swords, the fact is sword breakage is fairly common on the battlefield and when your opponents sword is more likely to break then you are more likely to kill him then he kill you. And not all swords are made to do the same thing. you have chopping swords like the dao which need the weight and thickness in the blade to carry through. or slicing swords like katana, or piercing swords like the jian or hacking swords like the broad sword. Katanas and jians needs a sharp edge to be effective and to have that will require a brittle edge that needs to be protected with a soft core. thats why katanas have diamond edges and jians have parabolic edges; and the smiths prefer folding and inserting a high carbon edge. Broad swords needs to be hack proof and therefore twist cores are preferred, the cords are thicker and the edges are not sharp so there is better edge retention. I won't take the ability to decapitate to be meaningful, can a foil sword decapitate? probably not as some doesn't even have an edge, its purpose is to punch a hole through chain mail and gaps in plate. a fan blade propeller from a kitchen exhaust fan can decapitate. Also, railway steel is not bad steel, it is actually well forged steel. pots and pans, i doubt is true as pots and pans of that era in china are mainly cast iron. so most records says railway steel. Now this being all said, swords are secondary weapons for samurais and similarly for Chinese warriors. primary weapons are bows and spears. You are talking of swords that people don't use a lot. You cannot make swords by the tens of thousands and expect all of these to last for years. The concept of good enough applies here. Brittle edges still break and crack, and soft cores don't stop that. The soft core is to keep the entire sword from breaking. A duller sword is more likely to withstand much more impacts. Foil swords are hardly used in the battlefield. Don't confuse sport and the battlefield. The kind of sword that is better for punching through mail armor are medieval swords that have a straight taper, sort of like a long long diamond. And of course the ability to decapitate is important. Ancient warriors are physically well armored, and Chinese lamellar armor, and that of their northern opponents were exceptional. The neck is one of the places that you have a better chance of cutting through than smashing your weapon across layers of lamellar armor. Slashing is how you fight in horseback, especially as ancient Chinese armies move away from purely infantry with chariots to having more cavalry. You fight with a jian on horseback, stabbing an opponent will result in the sword getting stuck in his body and knocking you down. For this reason cavalry would depend on the sabers (daos). One cannot say about the quality of steel with the state of the industry in China during that time. 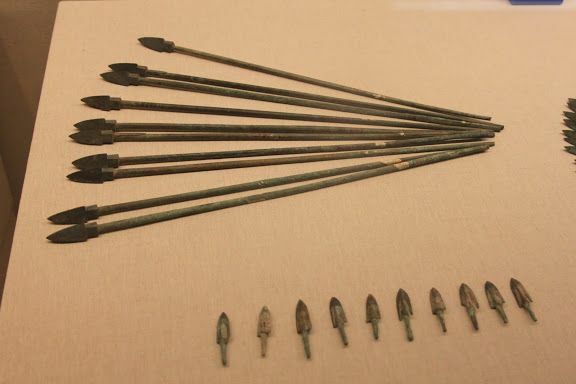 Chinese warriors don't use spears and bows much. They use crossbows and various pole arms --- the dagger axe or halberd, later the Pu-Dao, which are basically dao blades at the end of a long pole. Spear is spear. You cannot use a dagger axe like a spear, and it requires totally different technique. The dagger axe can be used to hook and pull down the shield, or strike an opponent at the back of his neck or behind his knees. The point can break through the skull like its being hit by a pike. 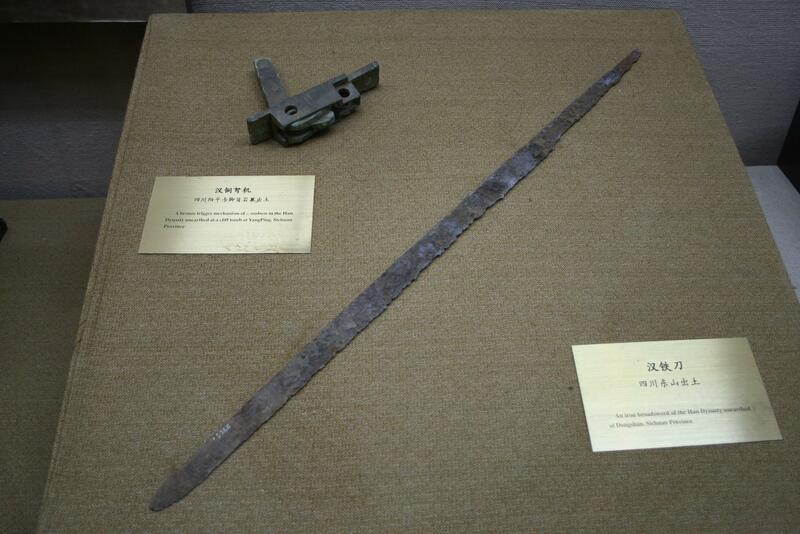 This weapon is so essential with ancient Chinese warfare that its very shape is the basis for a Chinese character. Later dynasties, the Ge or dagger-axe/halberd, is replaced by the Pudao. This shift has a lot to do with increasing combat against cavalry. Daos are heavily used by Chinese infantry. Jians, decreasingly after the Qin Dynasty. 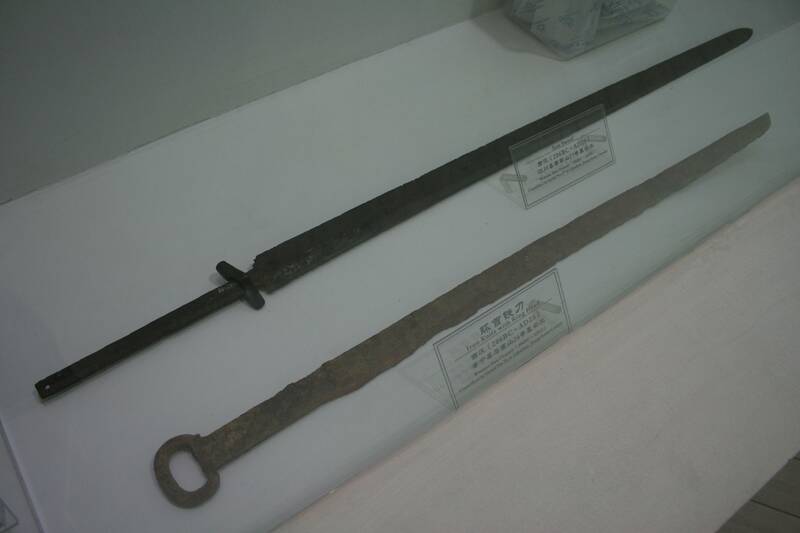 In fact the shift from Qin to Han also showed the shift from bronze Jian to steel dao. Steel jian is used only by officers, nobility and scholars, and is as much as a sport, a dueling and a decorative weapon to indicate your status or class. Jian is considered the nobleman's weapon, while dao is considered the plebian's weapon. The shift to dao is due to the fact it takes far less time to train a peasant in using one, compared to the skill needed to use a Jian. Using a jian is more like an art, the dao relies mainly on the peasant's muscle memory from cutting grass and harvest with their cutters. In fact, the dao is the easiest weapon to train a peasant in the fastest time possible. Due to the size and weight of the dao, this isn't something you carry around as a secondary weapon. They are primary weapons. Later you see the combination of dao and pole arm to create the pudao and zhanmadao. I mean, i did not say that you expect swords to last years, I have been saying that it needs to be able to last a battle so there is no argument there. the concept of good enough is vis-a-vis your opponent. iron sword > bronze sword, steel > iron, forged steel > steel and so on. And a cross bow is technically a bow isn't it? so my statement is correct, had I said slings like the romans used, then yes you are right. in this sense even Chinese slingshots are recuve bows firing pellets. Also, railway steel was imported from Russia, England and the sorts, so yes it was good quality steel. That is why you have manchurian railway incident - which was built by japan, the chinese eastern railway built by Russia - which sparked the russo japanese war. the kowloon canton railway built by the UK. so those steel are good steel comparatively. So unless you are suggesting that the ancient Chinese infantryman is less physically able to carry the weapons and gears of their eastern counterparts, then swords as a secondary weapon is not so hard of a concept to grasp. There are swords only infantry such as specialized double handed sword infantry like zweihander, or skirmishers but they are not numerous and typical. even infantry using zhanmao dao vs. cavelarty is highly reliant on the polearm formation to break up cavalry charges to be effective. It should be evident that a wall of lancers will hit the infantry with the double handed sword first with their lances before the infantry can swing their sword. the double handed sword is only effective when the cavalry run past the infantry squares. what people generally forget, and i blame TV and movies, is that the Chinese battlefield is not made of cold steel for a very long time. the Song had invented cannons and the the last 1000 years, three barrel pole guns are very common during the song and the ming. you see Chinese musketry and the secondary sword on their belts. But we are digressing, my point is, making steel is hard, making good steel is harder. yeah, just a comment: before you even start with steel, you need crude iron (out of a blast furnace) prepared "consistently"
So unless you are suggesting that the ancient Chinese infantryman is less physically able to carry the weapons and gears of their eastern counterparts, then swords as a secondary weapon is not so hard of a concept to grasp. There are swords only infantry such as specialized double handed sword infantry like zweihander, or skirmishers but they are not numerous and typical. even infantry using zhanmao dao vs. cavelarty is highly reliant on the polearm formation to break up cavalry charges to be effective. It should be evident that a wall of lancers will hit the infantry with the double handed sword first with their lances before the infantry can swing their sword. the double handed sword is only effective when the cavalry run past the infantry squares. There is a really huge difference in terms of performance, capability, or usage of different bow types. If you compare the short bow, to the long bow, to the composite bow, then to the crossbow, they really are not the same thing even if they are all projectile weapons. Even crossbows are not all the same. You have manually loaded crossbows, foot loaded crossbows, and ones which use a winching mechanism which all have different projectile speed/range and reload times. The difference between a bow and a crossbow is also akin to the difference between a bow and a musket in that you do not need well trained troops to operate one. i.e. to use a bow, especially a stronger bow like a longbow or a composite bow, you require many months or years of training to gain the muscular strength and accuracy to fire one. To maintain that muscular strength you need to upkeep those troops constantly not just at time of war. The British did this by instituting the yeoman class for their longbow men. This was a class which owned its own plot of land to cultivate with the provision that they had to train the bow weekly and be available at time of war. If you look at troops in roughly the same time period as the Qin, like the Persian Immortal army, they also had a complex military structure. Indeed. There are also a few other reasons. When you draw a bow of such strength, if you don't have the muscular strength, your arm will start shaking from the stress. That's going to ruin your aim. Typically a modern archer will only draw about 40 lbs, the English longben men would draw about 80lbs. Mongolian archers would draw about 170 to 180 lbs, and these are big husky men that eat meat. 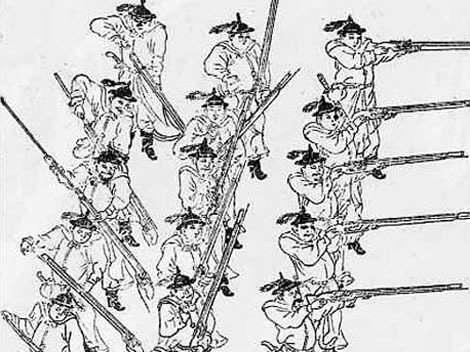 Typically Chinese armies would hire northerners as archers. A crossbow, assuming the Qin-Han dynasty type we see, are drawn with the foot, at an estimated 180 lbs. This means your slender peasant farmer could achieve this with his legs. Furthermore, crossbow troops are set up so that in a company, one man is firing, and one or two men are reloading extra crossbows. Its not uncommon to have a crossbow man with three or four crossbows already locked and loaded near him, which allows him to "burst" fire. The bolts are easy to make too, since they are just poured as molten metal into a cast, either of bronze or iron. Another problem of the archer is that it takes a long time to make a bow. You have to take strips of bamboo (or wood, depending on the region the bow is made), and glue them into a composite bow. The glue is from animals. This process is time intensive, that good bows are said to take a year to make, and you have to cure and dry the glue. In contrast the crossbow is mass manufactured from wood and metal. The Chinese state owns and controls all the blast furnaces in the country, and the "factories" to make crossbows and other weapons. In a way, this is a kind of a proto-military industrial complex. The use of such complexes began as early as the Zhou. By keeping such complexes under state control, it gives a new meaning to state power, and provides an enormous advantage over vassals, warlords, and rebels. Another way to put it is that the crossbow is the AK-47 for the ancient Chinese. There are local furnaces and so on, but these cannot provide the kind of high quality metal that is used for weapons (the process of carburizing and decarburizing is probably a state held secret at the penalty of death including your family). 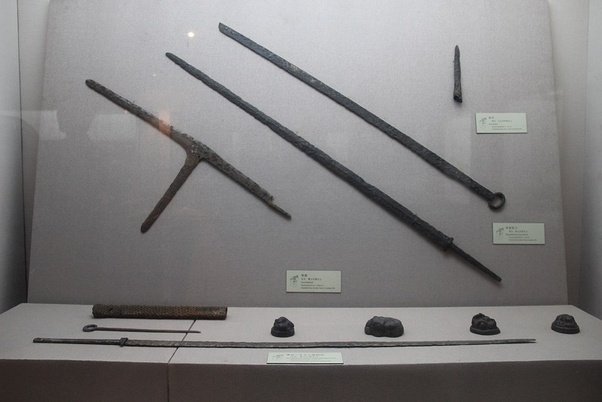 Local production of iron implements tend to center on things like shovels, pikes, plow shares, grass cutters like scythes and sickles and so on --- which on their own gives the Chinese farmer a profound advantage of their own, leading to an agricultural revolution and huge population growth.